normal-routine life and decrease patients’ dependability on others. 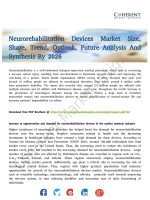 Higher incidences of neurological disorders has helped boost the demand for neurorehabilitation devices over the recent years. Pacific, Latin America, Middle East, and Africa. awareness and investment in health care. Holding Inc., Helius, Interactive Motion Technologies, Kinestica, Kinetic Muscles, Medtronic Plc., and Neurostyle. system is a modern assessment and therapy device for the treatment of the neurological disorders.